1 Mr. Mohammed Shafuk : tribal chief, arrested in Dase in October 2007. 22/ Mr. Osman Mohammed Adem: arrested in Adi Caigh in August 2008.
have been filed against Mr. Nessour nor been brought to a court. known. No charges have been filed against him nor has he been brought to a court. charges have been filed against him. whereabouts is not known. No charges have been filed against him. is not known. No charges have been filed against him. His whereabouts is not known. No charges have been filed against him. known. No charges have been filed against him. not known. No charges have been filed against him. 1994. His whereabouts is not known. No charges have been filed against him. have been filed against him. allowed to visit him not he has been brought to court. bailer which he rejected since no charge has been proved against him. against him nor took him to a court . him nor took him to a court. whereabouts, filed charges against him nor took him to a court of law. his whereabouts, filed charges against him nor took him to a court of law. him, disclosed his whereabouts, filed charges against him nor took him to a court . 7. Mr. Adam Ibrahim: Was graduated from Um Durman Islamic University. 5. Osman Salih Hamid: He was arrested in 1996 in Hagaat. 6. Mr. Ibrahim Idirss Mohammed Ali (Mangous): arrested in El Gash in 1997. (riba) but he has not been brought to an open court. brought to an open court. 13. Mr. Adam Muhammed Osman Daóud: a religion man, arrested in Gonia in 1999.
whereabouts, filed charges against him nor took him to a court. against him and he has not been brought to a court . him and he has not been brought to a court. Cemetery at Ginda 45 km from Asmara. filed against her and she has not been brought to a court. Transportation and member of both leadership of the ruling party and the Parliament. filed against him nor been taken to a court. No charges were filed against him nor been taken to a court. charges have been filed against Mr. Ali nor been brought to a court. have been filed against Mr. Ali nor been brought to a court. been filed against Mr. Ali nor been brought to a court. been filed against Mr. Ali nor been taken to a court. from police custody in Asmara to unknown place upon participation in hunger strike. Ali nor been brought to a court. against him nor been taken to a court. allowed to visit him. No charges were filed against him nor been taken to a court. him nor he been taken to a court. him nor been taken to a court. 48. Mr. Aho Mohammed Aho: was a Secretary of the Parliament of the South Red Sea. to visit him. No charges were filed against him nor been taken to a court. she prefers prison to keeping her marriage bond. No charges have been filed against him. in Wenjel Marmara but has not been brought to court. 69. Muhmaad Omer Ismail: Graduated in Cairo University. He was arrested in 2004. 70. Fr. Haili Niazgi: the head of the Full Gospel Church, arrested on 23rd May 2004. 72. Fr. Tesfasion Hagous: of the Protestant Rima Church. Arrested on 27th May 2004. 73. Fr. Kedani Waldai: arrested in 2004. 74. Fr. Abraham Blai: arrested in 2004.
been deported from a policestation in Asmara to Semble Prison. been deported from a policestation in Asmara to Simble Prison. Information accused him of trafficking. 91. Mr. Mohammed Geime Arri: was a police officer, arrested in November 2005. 92. Mr. Adam Salih: a journalist arrested in November 2005 in Asmara. 94. Mr. Abdlallah Ramadan: a businessman, arrested in late November 2005. 96. Mr. Mohammed Nour Ahmed: arrested in late November 2005. 98. Mr. Mohammed Adam Shalshal: was a police man arrested in November 2005. 99. Mr. Ahmed Musa Geime: was an army officer, arrested in November 2005. 104. Mr. Nouri Ahmed: arrested in South Dankalia in early 2006. 105. Mr. Wad Garray: arrested in Tesnei in April 2006. 106. Mr. Tesmgen Barhi: arrested in Tesnei in April 2006. 108. Mr. Malaki Mabrahtu: arrested in Tesnei in April 2006. 109. Mr. Abdlallah El Faki: a tailor arrested in Barento in May 2006. 112. Mr. Hamid Mahmoud Dalli: a mechanic, arrested in Barento in May 2006. 113. Mr. Omer Malik Baro: was a judge, arrested in Barento in May 2006. 114. Mr. Musa Osman Kheyar: arrested in Barento in May 2006. 117. Mr. Hussien Musa Halab: arrested in Tesnei on 5th August 2006. 118. Omer Humad: arrested in Agordat in Dcember 2006. 119. Mr. Totai Mohammed Salih Ali: arrested in Ablet district in September 2006. 120. Mr. Hebti Tekhle Sambet: arrested in Haikuta in September 2006. 121. Mr. Omer Ali: arrested in Kellit I September 2006. 122. Mr. Abdllah Salih Nassir: arrested in Tesney in September 2006. Arrested in late November 2006. 128. Mr. Mahmoud Haj Omer: arrested in Agordat in December 2006. 129. Mr. Yaseen Hamid: arrested in Hagat town in December 2006. 130. Mr.Omer Abu Alsadig: a former soldier, arrested in December 2006. The vast list contains names of prisoners of conscience in Eritrea, collected from various sources and compiled by Farajat team. Please forward your comments, corrections, photos and other information related to all disappeared or imprisoned Eritreans to Farajat team. This table is searchable if you have a name in mind. Ali Osman Tulon Ex-government employee from the Reformists. Alu Former government employee from the Reformists. Amna Osman Hamid 05-01-1980 Arareb (Age 42) EPLF Mother of 2. Mariano” 11-2003 Eritrea’s head of the Water Supply Department. This is the second term for “Wedi Mariano”: he had been released in 1994. Dawit Isaak 2001 Swedish Eritrean - his family in Gothenburg (Sweden) did not hear from him or have any information and about what he is accused. Desta Msgun Ketema 1982 Deray (Akhrur) He was a farmer and was supporting his kids, mother and father and his wife died the year before his arrest. Nobody knows why he was arrested or what happened to him. Ermias Debessay (“Papayo”) 15-03-2003 After serving a six-year sentence, was re-arrested. Also arrested with him was his sister. Gebray Aklilu 05-18 -2002 Hagaz 1st National Service. 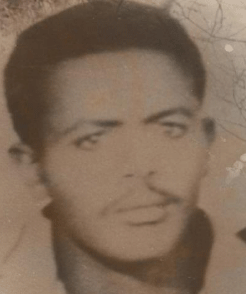 Gebre Teclia Lijam 1985 Beleu He was ELF militia head, after the conspiracy of EPLF and TPLF, he was imprisoned around the beginning of 1982, then he was released. Again after the release after 3 weeks visited his sibling in Keren, where he was imprisoned again. Habtom Teclia Lijam 08-1987 Beleu Since they day he was arrested no one knows his whereabouts, the same also goes to his brother. Haleqa Mebrahtu 04-2003 An intelligence officer was arrested without charges. Ibrahim Saeed 07-2003 Director General for Relief and Logistics in the Eritrean Relief and Refugee Commission (ERREC). Kerba Abdu Al-Amin 1992 Mansura (Age 45) After independence she went to Mansura to make small buiseness and get bread for her children. Accused of supporting Mujahidin. Since her imprisonment no one knows her whereabouts. 19-09-2001 Member of “G-15,” Eritrea’s former "local governments chief"
Representative of the "war veterans" and leader of "zone 1" in the 60's and before his arrest was the leader of Barka parliament. Mebrahtu (Haleqa) Ghebremedhin Tsegazghi 03-2003 Asmara GOE Major Major Mebrahtu Ghebremdhin was a police officer at the Eritrean Police head quarter (Agip). Since the day he was arrested no one knows his whereabouts, and no one knows where he arrested. Al Gadayn He was a leader of "united organization"
10-2001 Asmara GOE He was Head of the Civil Actions (Non-Criminal Cases) Department in in the Attorney General's Office. He disappeared while he was preparing to depart to South Africa for scholarship, probably as a result of several articles he wrote in newspapers during the short period of "free" press. 02-2002 The Voice of the Broad Masses radio station. Saleh Mohamed Idris Abu Ajaj 15-10-1995 Aqordat He was from the Eritrean veteran fighters and vice president of zone 1 during the 60's. Saleh Osman Aray 28-09-1995 Aqordat Former member of the 'revolutionary committee" organization. Also he was the governor of mansoura prior to his arrest. 15-03-2003 A mother of four. Simret Seyoum, 01-2002 Editor of "Setit" newspaper and he was arrested on 6 January 2002 near the Sudanese border as he was trying to flee to the Sudan. Solomon Habtom 11- 2002 His wife, Asgedet Semere, was released from jail since 11- 2002. Teweldemedhin Tesfamariam 04-2003 Eritrea’s ambassador to Kenya as well as head of Africa Desk within the Ministry of Foreign Affairs was recalled to Eritrea and arrested without charges. Yamane Fessehaye “Wedi Reg’o”) 11-2003 Colonel Head of the Crime Prevention Department in the police force.